Amylase (/ˈæmɪleɪs/) is an enzyme that catalyses the hydrolysis of starch into sugars. Amylase is present in the saliva of humans and some other mammals, where it begins the chemical process of digestion. Foods that contain large amounts of starch but little sugar, such as rice and potatoes, may acquire a slightly sweet taste as they are chewed because amylase degrades some of their starch into sugar. The pancreas and salivary gland make amylase (alpha amylase) to hydrolyse dietary starch into disaccharides and trisaccharides which are converted by other enzymes to glucose to supply the body with energy. Plants and some bacteria also produce amylase. 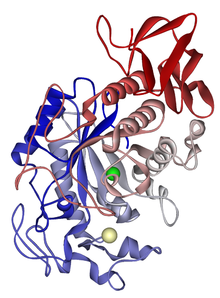 As diastase, amylase is the first enzyme to be discovered and isolated (by Anselme Payen in 1833). Specific amylase proteins are designated by different Greek letters. All amylases are glycoside hydrolases and act on α-1,4-glycosidic bonds. The α-amylases (EC 3.2.1.1 ) (CAS# 9014-71-5) (alternative names: 1,4-α-D-glucan glucanohydrolase; glycogenase) are calcium metalloenzymes. By acting at random locations along the starch chain, α-amylase breaks down long-chain saccharides, ultimately yielding maltotriose and maltose from amylose, or maltose, glucose and "limit dextrin" from amylopectin. Because it can act anywhere on the substrate, α-amylase tends to be faster-acting than β-amylase. In animals, it is a major digestive enzyme, and its optimum pH is 6.7–7.0. In human physiology, both the salivary and pancreatic amylases are α-amylases. Another form of amylase, β-amylase (EC 3.2.1.2 ) (alternative names: 1,4-α-D-glucan maltohydrolase; glycogenase; saccharogen amylase) is also synthesized by bacteria, fungi, and plants. Working from the non-reducing end, β-amylase catalyzes the hydrolysis of the second α-1,4 glycosidic bond, cleaving off two glucose units (maltose) at a time. During the ripening of fruit, β-amylase breaks starch into maltose, resulting in the sweet flavor of ripe fruit. 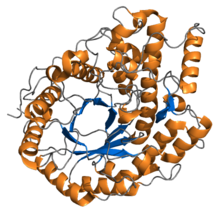 γ-amylase (EC 3.2.1.3 ) (alternative names: Glucan 1,4-α-glucosidase; amyloglucosidase; Exo-1,4-α-glucosidase; glucoamylase; lysosomal α-glucosidase; 1,4-α-D-glucan glucohydrolase) will cleave α(1–6) glycosidic linkages, as well as the last α(1–4)glycosidic linkages at the nonreducing end of amylose and amylopectin, yielding glucose. The γ-amylase has most acidic optimum pH of all amylases because it is most active around pH 3. Alpha and beta amylases are important in brewing beer and liquor made from sugars derived from starch. In fermentation, yeast ingest sugars and excrete alcohol. In beer and some liquors, the sugars present at the beginning of fermentation have been produced by "mashing" grains or other starch sources (such as potatoes). In traditional beer brewing, malted barley is mixed with hot water to create a "mash," which is held at a given temperature to allow the amylases in the malted grain to convert the barley's starch into sugars. Different temperatures optimize the activity of alpha or beta amylase, resulting in different mixtures of fermentable and unfermentable sugars. In selecting mash temperature and grain-to-water ratio, a brewer can change the alcohol content, mouthfeel, aroma, and flavor of the finished beer. In some historic methods of producing alcoholic beverages, the conversion of starch to sugar starts with the brewer chewing grain to mix it with saliva. This practice is no longer widely in use. Alpha amylase is often listed as an ingredient on commercially package milled flour. Bakers with long exposure to amylase-enriched flour are at risk of developing dermatitis or asthma. In molecular biology, the presence of amylase can serve as an additional method of selecting for successful integration of a reporter construct in addition to antibiotic resistance. As reporter genes are flanked by homologous regions of the structural gene for amylase, successful integration will disrupt the amylase gene and prevent starch degradation, which is easily detectable through iodine staining. Amylase also has medical applications in the use of Pancreatic Enzyme Replacement Therapy (PERT). It is one of the components in Sollpura (Liprotamase) to help in the breakdown of saccharides into simple sugars. An inhibitor of alpha-amylase, called phaseolamin, has been tested as a potential diet aid. When used as a food additive, amylase has E number E1100, and may be derived from swine pancreas or mould mushroom. Bacilliary amylase is also used in clothing and dishwasher detergents to dissolve starches from fabrics and dishes. Factory workers who work with amylase for any of the above uses are at increased risk of occupational asthma. Five to nine percent of bakers have a positive skin test, and a fourth to a third of bakers with breathing problems are hypersensitive to amylase. Blood serum amylase may be measured for purposes of medical diagnosis. A higher than normal concentration may reflect one of several medical conditions, including acute inflammation of the pancreas (it may be measured concurrently with the more specific lipase), but also perforated peptic ulcer, torsion of an ovarian cyst, strangulation, ileus, mesenteric ischemia, macroamylasemia and mumps. Amylase may be measured in other body fluids, including urine and peritoneal fluid. A January 2007 study from Washington University in St. Louis suggests that saliva tests of the enzyme could be used to indicate sleep deficits, as the enzyme increases its activity in correlation with the length of time a subject has been deprived of sleep. In 1831, Erhard Friedrich Leuchs (1800���1837) described the hydrolysis of starch by saliva, due to the presence of an enzyme in saliva, "ptyalin", an amylase. The modern history of enzymes began in 1833, when French chemists Anselme Payen and Jean-François Persoz isolated an amylase complex from germinating barley and named it "diastase". In 1862, Alexander Jakulowitsch Danilewsky (1838–1923) separated pancreatic amylase from trypsin. Saccharides are a food source rich in energy. Following the agricultural revolution 12,000 years ago, human diet began to shift more to plant and animal domestication in place of gathering and hunting. Large polymers such as starch are partially hydrolyzed in the mouth by the enzyme amylase before being cleaved further into sugars. Therefore, humans that contained amylase in the saliva would benefit from increased ability to digest starch more efficiently and in higher quantities. Despite the obvious benefits, early humans did not possess salivary amylase, a trend that is also seen in evolutionary relatives of the human, such as chimpanzees and bonobos, who possess either one or no copies of the gene responsible for producing salivary amylase. This gene, AMY1, originated in the pancreas. A duplication event of the AMY1 gene allowed it to evolve salivary specificity, leading to the production of amylase in the saliva. In addition the same event occurred independently in rodents, emphasizing the importance of salivary amylase in organisms that consume relatively large amounts of starch. However, not all humans possess the same number of copies of the AMY1 gene. Populations known to rely more on saccharides have a higher number of AMY1 copies than human populations that, by comparison, consume little starch. The number of AMY1 gene copies in humans can range from six copies in agricultural groups such as European-American and Japanese (two high starch populations) to only 2-3 copies in hunter-gatherer societies such as the Biaka, Datog, and Yakuts. The correlation that exists between starch consumption and number of AMY1 copies specific to population suggest that more AMY1 copies in high starch populations has been selected for by natural selection and considered the favorable phenotype for those individuals. Therefore, it is most likely that the benefit of an individual possessing more copies of AMY1 in a high starch population increases fitness and produces healthier, fitter offspring. This fact is especially apparent when comparing geographically close populations with different eating habits that possess a different number of copies of the AMY1 gene. Such is the case for some Asian populations that have been shown to possess few AMY1 copies relative to some agricultural population in Asia. This offers strong evidence that natural selection has acted on this gene as opposed to the possibility that the gene has spread through genetic drift. ^ Hill R, Needham J (1970). The Chemistry of Life: Eight Lectures on the History of Biochemistry. London, England: Cambridge University Press. p. 17. ^ Silverman RB (2002). The Organic Chemistry of Enzyme-catalyzed Reactions (2nd ed.). London, England: Academic Press. p. 1. ^ Stenesh J (1998). Biochemistry. 2. New York, New York: Plenum. p. 83. ^ Meyers RA (1995). Molecular Biology and Biotechnology: A Comprehensive Desk Reference. New York, New York: Wiley-VCH. p. 296. ^ "Effects of pH (Introduction to Enzymes)". worthington-biochem.com. Retrieved 17 May 2015. ^ Rejzek M, Stevenson CE, Southard AM, Stanley D, Denyer K, Smith AM, Naldrett MJ, Lawson DM, Field RA (March 2011). "Chemical genetics and cereal starch metabolism: structural basis of the non-covalent and covalent inhibition of barley β-amylase". Molecular BioSystems. 7 (3): 718–30. doi:10.1039/c0mb00204f. PMID 21085740. ^ "Amylase, Alpha", I.U.B. : 3.2.1.11,4-α-D-Glucan glucanohydrolase. ^ Maton A, Hopkins J, McLaughlin CW, Johnson S, Warner MQ, LaHart D, Wright JD (1993). Human Biology and Health. Englewood Cliffs, New Jersey, USA: Prentice Hall. ISBN 0-13-981176-1. ^ Morren MA, Janssens V, Dooms-Gossens A, Van Hoeyveld E, Cornelis A, De Wolf-Peeters C, Heremans A (November 1993). "alpha-Amylase, a flour additive: an important cause of protein contact dermatitis in bakers". Journal of the American Academy of Dermatology. 29 (5 Pt 1): 723–8. doi:10.1016/0190-9622(93)70237-n. PMID 8227545. ^ Park HS, Kim HY, Suh YJ, Lee SJ, Lee SK, Kim SS, Nahm DH (September 2002). "Alpha amylase is a major allergenic component in occupational asthma patients caused by porcine pancreatic extract". The Journal of Asthma. 39 (6): 511–6. doi:10.1081/jas-120004918. PMID 12375710. ^ "Anthera Pharmaceuticals - Sollpura." Anthera Pharmaceuticals - Sollpura. N.p., n.d. Web. 21 July 2015.<http://www.anthera.com/pipeline/science/sollpura.html Archived 2015-07-18 at the Wayback Machine>. ^ Udani J, Hardy M, Madsen DC (March 2004). "Blocking saccharide absorption and weight loss: a clinical trial using Phase 2 brand proprietary fractionated white bean extract" (PDF). Alternative Medicine Review. 9 (1): 63–9. PMID 15005645. Archived from the original (PDF) on 2011-07-28. ^ Mapp CE (May 2001). "Agents, old and new, causing occupational asthma". Occupational and Environmental Medicine. 58 (5): 354–60, 290. doi:10.1136/oem.58.5.354. PMC 1740131. PMID 11303086. ^ "Acute Pancreatitis - Gastrointestinal Disorders - Merck Manuals Professional Edition". merck.com. ^ Erhard Friedrich Leuchs (1831) "Wirkung des Speichels auf Stärke" (Effect of saliva on starch), Poggendorff's Annalen der Physik und Chemie, vol. 22, page 623 (modern citation: Annalen der Physik, vol. 98, no. 8, page 623). See also: Erhard Friedrich Leuchs (1831) "Über die Verzuckerung des Stärkmehls durch Speichel" (On the saccharification of powdered starch by saliva), Archiv für die Gesammte Naturlehre (Archive for All Science), vol. 21, pages 105–107. ^ "History of Biology: Cuvier, Schwann and Schleiden". pasteur.fr. 8 April 2002. Retrieved 17 May 2015. ^ Danilewsky (1862) "Über specifisch wirkende Körper des natürlichen und künstlichen pancreatischen Saftes" (On the specifically-acting principles of the natural and artificial pancreatic juice), Virchows Archiv für pathologische Anatomie und Physiologie, und für klinische Medizin, vol. 25, pages 279–307. Abstract (in English). ^ Vuorisalo, Timo; Arjamaa, Olli (March–April 2010). "Gene-Culture Coevolution and Human Diet". American Scientist. 98 (2): 140. ^ a b Perry GH, Dominy NJ, Claw KG, Lee AS, Fiegler H, Redon R, Werner J, Villanea FA, Mountain JL, Misra R, Carter NP, Lee C, Stone AC (October 2007). "Diet and the evolution of human amylase gene copy number variation". Nature Genetics. 39 (10): 1256–60. doi:10.1038/ng2123. PMC 2377015. PMID 17828263.